Café. Waiting. Love. is the second part of novelist Giddens Ko’s trilogy of love stories – the first part being the popular You Are The Apple Of My Eye (2011) and the last, Achoo, is slated for release next year. The three movies, though, does not seem to be a continuation of the same storyline, as for this film, the focus shifts to Li Siying (Vivian Sung), a college freshman, and A-Tuo (Bruce), a college student who has delayed graduation for seven years. Despite not directing this film, Giddens Ko’s pervasive influence extends throughout Café. Waiting. Love – he is not only the author of the original novel, but also credited as the Producer and Screenwriter of this movie. It is then somewhat inevitable that Café. Waiting. Love. bears similarities to You Are The Apple Of My Eye, in terms of the ridiculous events in the storyline (skating around in a bikini, and producing food from one’s head). That said, Café. Waiting. Love. holds its own against its predecessor, in part thanks to director Chiang Chin-lin. The film is Chiang’s first full-length feature film, after working as the executive director on You Are The Apple Of My Eye. With Chiang at the helm, the film avoids being self-indulgent and overly sentimental, traps that You Are The Apple Of My Eye might have fallen into. This is not to say that Café. Waiting. Love. pays less attention to detail or is harder to relate to. Chiang does a good job in adapting the novel to film, making it interesting enough to sustain the viewer’s attention for the two hours, with unexpected twists and turns and introductions to new characters. The storytelling also makes the film enjoyable to one unfamiliar with the novel, when other adapted films might have assumed that the viewer had prior knowledge of the storyline. 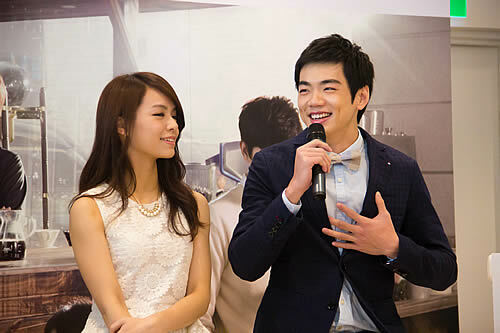 Like the director, the film is the two main leads’ – Sung and Bruce – movie debut. The two newcomers play their characters reasonably well, holding their own against the older, more experienced actors like Pauline Lan and Li Luo, who play Golden Knife Auntie and Brother Bao respectively. 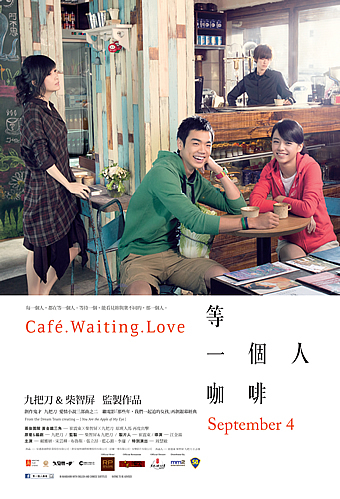 Back to the main couple – Sung’s character, Siying, is the primary narrator of the story, who somehow gets employed in the café central to the story, while A-Tuo (Bruce) is her college senior and a college legend. After a series of coincidences, Siying and A-Tuo become good friends, and, as in all romantic comedies, A-Tuo inevitably falls for Siying. Siying, however, pines for the classic Prince Charming – Zeyu – who might not be who she thinks he is. Unlike typical rom-coms, A-Tuo urges Siying to chase after Zeyu while chasing her at the same time. In comparison, Bruce stands out more than Sung by virtue of his character in the movie. The viewer is first introduced to A-Tuo as a bikini-wearing, roller-skating college senior, while beneath his happy-go-lucky exterior is someone hugely sentimental… just barely. Bruce does a good job in acting as the underdog for Siying’s affections, and is convincingly innocent, making the viewer root for A-Tuo as he woos Siying. Another standout character is Abusi (or Albus, played by Megan Lai), the barista of the café, which Siying is employed in. Lai, who cut her hair for the film, is handsome and mysterious as Abusi, and manages to leave a strong impression in the viewer despite her short screen time and even shorter script. Coupled with the ethereal Vivian Zhou as the owner of the café, the café exudes an air of otherworldly-ness, which might be more apt than expected. The film has also been said to be an exploration of the act of waiting for love, and it can be said that everyone in the film was waiting for someone else. With this theme, one would expect the film to be draggy and filled with passive, uninspiring characters. This was not the case, as although there was a lot of waiting, this was not the central defining characteristic of the characters. In fact, while waiting is necessary, the film shows that doing something about it would probably vastly improve your chances. The film’s twists and turns, and occasional sweat drop moments, do bear the stamp of a Giddens Ko novel and his ability to think out of the box. Viewers should not catch the movie expecting it to be a copy of You Are The Apple Of My Eye, but instead appreciate it as it is – a funny, heart-warming and endearingly-ridiculous film.